For the December issue of Chief Learning Officer magazine, I had the privilege of writing an article entitled “Triple-A Thinking,” which provided an overview of the three disciplines of strategic thinking: Acumen, Allocation and Action. I use the word “discipline” as it relates to strategic thinking because as Michael Porter of Harvard Business School once wrote, “Strategic thinking rarely occurs spontaneously.” In fact, it rarely occurs at all. My research with 154 companies showed that only 3 out of every 10 managers are strategic. Acumen: What key insight is driving this initiative, project or activity? Allocation: What activities, projects or tactics should be eliminated in order to more effectively focus resources? Action: What actions should I focus on to create competitive advantage? If 2011 is going to yield new growth for your business, then what is required is new thinking. And new thinking demands the discipline to carve out time in our already overflowing calendars to think individually and collectively about strategic issues. 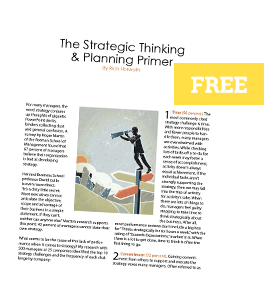 Strategic thinking isn’t about adding more work to our already full plates. It’s about enhancing our view of the work and improving the ability to perform it.